Here are position-by-position breakdowns of Temple's depth chart leading up to the start of the 2018 season. Previously, we previewed the quarterbacks, defensive linemen, linebackers, wide receivers and tight ends, running backs, defensive backs and the offensive line. Here is a look at the Owls' special teams. 6-0, 200, Jr., Philipsburg, Pa.
Boumerhi was supposed to redshirt his freshman year, but after an injury to starter Austin Jones, he not only became the regular at midseason, but also earned second-team all-conference honors when he made 15 of 17 field goals. Last season, he didn't match his freshman performance, hitting on 15 of 23. 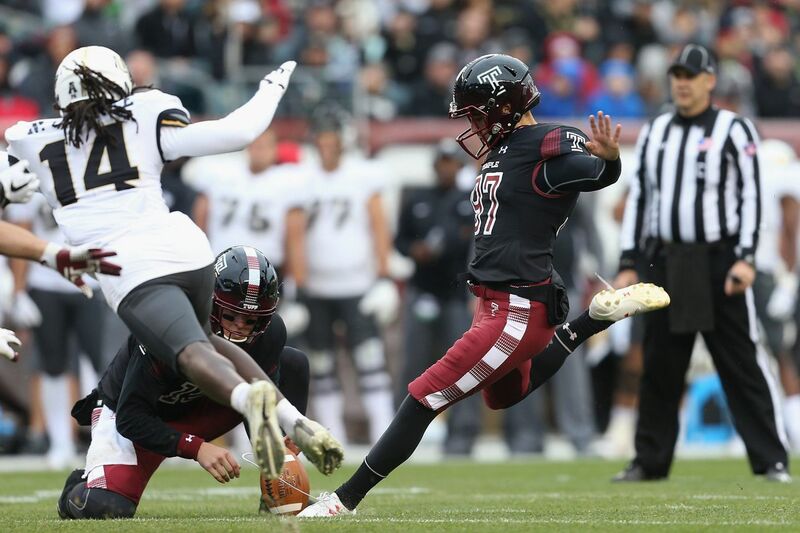 He will again be the placekicker and will look to revert to his freshman-year form. 5-8, 160, R-Fr., Lititz, Pa.
A walk-on, Mobley appears to be the main backup. He joined the team last fall after kicking 11 field goals in his high school career. He appears to be the favorite to succeed four-year starter Alex Starzyk. Bowler walked on last season after competing for Downingtown West. A good athlete who was a javelin thrower at Cheltenham High, Cavallucci was also a first-team all-conference punter as a senior. He joined the Owls as a walk-on last fall. He is still relatively inexperienced, having punted only one season, as a senior at Eastern High. But he has intrigued coaches with his ability to rugby-punt to the left or right, so he could be a situational punter. 6-2, 220, Jr., West Hartford, Conn. Besides being the Owls' leading receiver last season with 46 receptions for 668 yards and four touchdowns, Wright excels as both a kickoff and punt returner. Last season, he returned a kickoff and a punt for a TD. Wright averaged 11.0 yards on 11 punt returns and 24.9 yards on 13 kickoff returns. He has great vision and can cut on a dime. Temple wide receiver Isaiah Wright running with the football against Navy last season. 6-1, 190, R-So., North Ft. Myers, Fla. There could be a time when Wright needs a breather, and Johnson, who has breakaway speed, is among the players who have been returning kicks during practice. 6-0, 185, R-Fr., Randallastown, Md. Another player with explosive speed, Blue also has received reps in training camp and is someone the coaches wouldn't be afraid to use. Randall was the Owls' only first-team all-conference player last season, at safety. If the Owls need someone to field a punt cleanly and make a fair catch, they wouldn't hesitate to use Randall, whose strength is holding onto the ball.